New Jersey state authorities abruptly released Kaci Hickox Monday after a three-day involuntary quarantine ordered by Governor Chris Christie. A nurse who had worked caring for Ebola patients in West Africa, Hickox was detained Friday at Newark International Airport and held against her will despite having no symptoms of the disease. Christie, a Republican, and New York Governor Andrew Cuomo, a Democrat, jointly announced the mandatory quarantine for all health care workers returning from Sierra Leone, Liberia and Guinea who had been in contact with Ebola victims there. The quarantine was based on no scientific or health considerations, since people without symptoms of Ebola, even if they later manifest the disease, are not contagious. It is no accident that both Christie and Cuomo have presidential ambitions. Christie has said he will decide next year whether to seek the Republican nomination in 2016, while Cuomo is expected to run for the Democratic nomination if Hillary Clinton does not. Each governor was seeking to pander to the fear and panic being whipped up by the corporate-controlled media and sections of the ultra-right over Ebola. Unexpectedly for Christie, who has built a national reputation on the basis of his bullying persona, the nurse he ordered detained fought back strongly, speaking out first in an open letter published by the Dallas Morning News, then on several Sunday television programs which interviewed her in quarantine. Hickox said she was treated “as if I were a criminal” when she arrived at Newark on a flight bringing her home to the US from Sierra Leone. She was pulled aside by armed agents and held without explanation even though a forehead scan showed her temperature as normal. Eight police cars were mobilized to take the nurse to a Newark hospital, where an oral thermometer showed a temperature of 98.6 degrees. A doctor told her, “There’s no way you have a fever. Your face is just flushed.” A test for Ebola was negative. Nonetheless, Hickox was placed in quarantine, in an improvised tent-like structure, without shower facilities or access to communications. Actually, of course, Hickox never had any symptoms. Characteristically, Christie made his arrogant declaration while campaigning in Melbourne, Florida for the state’s Republican governor, Rick Scott, and building his own profile as a potential presidential candidate. According to press reports in New York and New Jersey, Christie and Cuomo decided to impose a quarantine after Dr. Craig Spencer, a physician at Columbia Presbyterian Hospital in Manhattan, came down with a fever and tested positive for Ebola, a week after returning from a humanitarian effort in West Africa. At the press conference announcing the quarantine, Cuomo joined Christie in vilifying the health care workers who had helped Ebola victims. The New York governor portrayed Dr. Spencer as willfully defying CDC regulations because he went to a restaurant and a bowling alley and travelled on the subway before becoming ill.
Amid mounting media furor over the detention of Kaci Hickox, both governors sought to pull back, at least for public relations purposes. Cuomo issued a statement praising Hickox for her work in West Africa and saying that New York state residents returning from the Ebola zone should stay home for 21 days rather than be quarantined in a hospital. Christie’s office indicated that this was the policy in New Jersey as well, claiming that Hickox was only detained because she was a Maine resident, although there was no explanation of why she was not allowed to travel on to her home state. 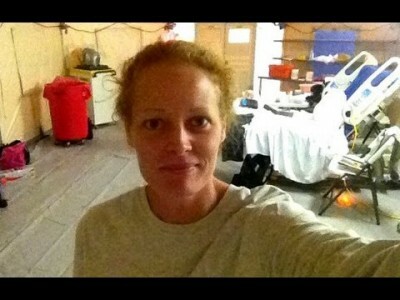 Then on Monday afternoon, Hickox was driven out of the Newark hospital in a black SUV, reportedly on the road to Maine, where she will be ordered to self-quarantine at home for the remaining 17 days, rather than stay confined in a medical facility. An attorney for Hickox, longtime civil rights lawyer Norman Siegel, said she would file a lawsuit against her detention in New Jersey. Two other states, Connecticut and Illinois, both with Democratic governors, have similar quarantine orders in effect for health care workers returning from West Africa. The state of Florida has issued a similar, but more limited, order. US government officials and the American media have paid far more attention to the handful of Ebola cases—and false reports of possible Ebola cases—in the US than to the ongoing tragedy of the mass epidemic in West Africa. There, the number of deaths officially recorded has risen to nearly 5,000 people, out of more than 10,000 diagnosed as infected. The real numbers are expected to be much higher, with estimates reaching some 15,000 dead. US military personnel are on the ground in Liberia building treatment facilities, as ordered by President Obama last month, an effort that appears more and more suspect, as the World Health Organization estimates that there will not be nearly enough medical volunteer personnel available to work in the new facilities. Meanwhile the US Army was reported to be isolating a dozen soldiers from the initial group deployed to Liberia after they returned from the Ebola zone to their base in Vicenza, Italy. If the Pentagon imposes this practice across the board, the total number of soldiers being quarantined will rise substantially as more rotate out of Liberia, although no cases of Ebola have been reported, and the soldiers were not supposed to have any contact with victims of the disease while engaged in construction work.